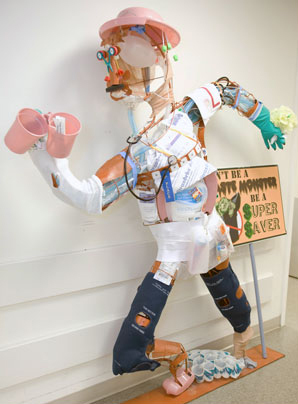 A 6-foot-tall "waste monster" fashioned out of dressings, ventilator tubes, monitoring electrodes and cannulas is stalking the hallways of 8 East Surgical Unit at Ronald Reagan UCLA Medical Center. Along with a sign that says "Don't be a waste monster, be a super saver," the waste monster was created by members of the 8 East Unit Practice Council to remind staff to take only the supplies they need for their shift and to return the unused ones to the stockroom once the patient is discharged from the room. The monster, which helped the Unit Practice Council win a creativity award at UCLA Health's Evidence-based Practices Conference in April, was the brainchild of care partner Marcio Dos Santos, who was distressed to see so many good supplies tossed in the trash every week. "Marcio wasn't born in this country and he told the UPC group that where he came from, people would be very upset with the amount of supplies we waste," says unit director Patti Brownstein, B.S.N., R.N., NE-BC. "It bothered him so much that he wanted to do something about it." To get a handle on the problem, the 8 East Unit Practice Council arranged for volunteers to itemize all the unused supplies in patients' rooms over a four-month period last year. They found that the supplies that were most often wasted included alcohol prep pads, thermometers, BD blunt plastic cannulas, BD lever lock cannulas, monitoring electrodes and medical tape. Working with information on supply costs from Material Management, the UPC estimated how much could be saved by restocking these unopened and undamaged supplies rather than throwing them out. According to their analysis, the unit could save as much as $6,000 a month, or $72,000 a year. "I've been trying to tell people, but it was really something Marcio had a passion for," Brownstein says. "I thought the Unit Practice Council's approach was very good." The waste monster is going on exhibit at the American Nurses Credentialing Center's Magnet Conference in Los Angeles next month in the hope it might inspire other hospitals to think about wasted supplies, Brownstein says. If the waste monster looks a little ragged when the conference ends, he is likely to be rebuilt so he can continue haunting the 8 East corridors.